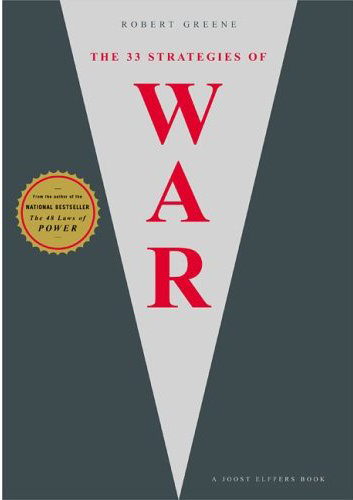 Today, I'm posting a summary of The 33 Strategies of War by Robert Greene. Hope this helps in your Sojourn of Septillion Steps! Keep your presence of mind whatever the circumstances. Make your mind tougher by exposing it to adversity. Learn to detach youself from the chaos of the battlefied. The critical elements in war are speed and adaptability--the ability to move and make decisions faster than the enemy. Break your forces into independent groups that can operate on their own. Give them the spirit of the campaign, a mission to accomplish, and room to run. Build a reputation for being a little crazy. Fighting you is not worth it. Uncertainty can be better than an explicit threat. If your opponents aren't sure what attacking you will cost, they will not want to find out. Instead of trying to dominate the other side's every move, work to define the nature of the relationship itself. Control your opponent's mind, pushing emotional buttons and compelling them to make mistakes. Find the source of your enemy's power. Find out what he cherishes and protects and strike. Frontal assaults stiffen resistance. Instead, distract your enemy's attention to the front, then attack from the side when they expose their weakness. Make it hard for your enemies to know what is going on around them. Feed their expectations, manufacture a reality to match their desires, and they will fool themselves. Control people's perceptions of reality and you control them. The cause you are fighting for must seem more just than the enemy's. Questioning their motives and making enemies appear evil can narrow their base of support and room to maneuver. When you come under moral attack from a clever enemy, don't whine or get angry--fight fire with fire. Take small bites to play on people's short attention span. Before they notice, you may acquire an empire. Infiltrate your ideas behind enemy lines, sending messages through little details. Lure people into coming to the conclusions you desire and into thinking they've gotten there by themselves. To take something you want, don't fight those who have it, but join them. Then either slowly make it your own or wait for the right moment to stage a coup. Terror can paralyze a people's will to resist and destroy their ability to plan a strategic response. The goal is to cause maximum chaos and provoke a desperate overreaction. To counter terror, stay balanced and rational.